Here at Beaum Vape, all of our orders are shipped via Royal Mail and the range of delivery services offered are displayed in the following table. Collect In Store* Order will be ready for collection within 1 hour of placing from the Town Store in Bridge Street. *Please bring your confirmation email, payment card or proof of ID when using the collect in store service. We will not be able to hand over any goods without proof of purchase. **Working days are defined as Monday – Friday excluding public and bank holidays. All orders placed on Saturday and Sunday will be processed and dispatched on the next working day. We request that orders are placed before 3pm UK time to ensure that delivery is sent out on the same working day. Orders placed after 3pm will be treated as having been placed on the next working day although we will endeavour to send out goods as quickly as possible following receipt of order. If you have an urgent requirement after 3pm please contact us. ***Please note all of our delivery services are covered in line with the insurance cover offered by Royal Mail dependent on which delivery option is chosen. More information can be found here. We recommend that you choose the delivery option that covers your order cost in full as we will only replace or refund goods up to value of the insurance listed in the table should something go wrong that is out of our control. + If an item is returned to us by your local customs office we can provide a refund minus any postage costs incurred by ourselves. If an item is seized by your local customs office this will be the responsibility of the customer to resolve the issue. ++ As a result of the TPD regulations, cross border sales within to EU are now restricted to member states that permit cross border sales and registration. Unfortunately we are no longer able to offer international shipping to EU Member States that do no permit cross border sales. All possible destinations are available from the drop down menu at the cart. For further information please see the list of allowable EU member states here. All domestic delivery options are only available in the UK Mainland. For any orders to UK Overseas Territories please select International Shipping as we are unfortunately unable to offer the same services in line with Royal Mail’s delivery options. 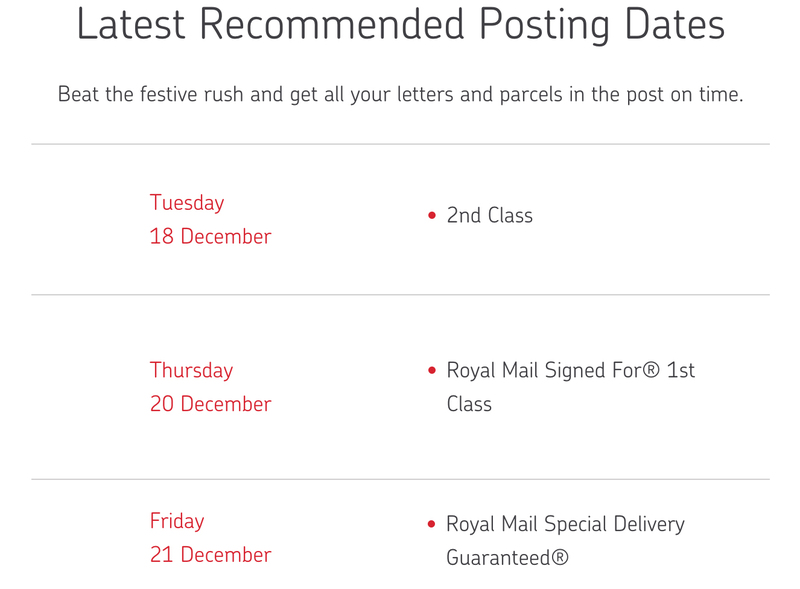 Royal Mail’s latest recommended posting dates are shown below and for further information on Royal Mail’s Delivery service over Christmas & New Year please click here. We apologise for any inconvenience that this may cause and thank you in advance for your understanding. Most of all we wish you all a very happy festive period from the whole team at BEAUM. All orders placed up to 9am on Monday 24th December 2018 will be dispatched same day as per the above shipping information. Due to Royal Mail’s Christmas shut down, any orders placed after this time will not be dispatched until Thursday 27th December. For orders placed on Friday 21st December for delivery on Monday 24th December, please ensure that Special Delivery Guaranteed by 1pm is the chosen shipping method. For orders placed on Friday 21st December for delivery on Saturday 22nd December, please ensure that Special Delivery Saturday Guaranteed is the chosen shipping method as this is the only shipping class that will be delivered on this date. Any orders placed before 3pm on Friday 28th and before 9am Monday 31st December will be dispatched same day. For orders placed on Friday 28th December for delivery on Saturday 29th December please ensure that Special Delivery Saturday Guaranteed is the chosen shipping method as this is the only shipping class that will be delivered on this dates. Any orders placed after 9am on Monday December 31st will not be dispatched until Wednesday 2nd January due to Royal Mail’s Collection shut down. Any orders dispatched prior to these dates with anticipated delivery on any of these days will not be delivered until the next working day in line with the chosen shipping class. You should receive a confirmation email from us once your item has been shipped. Please do not hesitate to contact us at any time during the delivery process if you have any queries or questions about your order. If your order has not arrived within 2 working days of the expected delivery date or you require any further information regarding shipping or returns, please contact us here. All orders are covered under the Consumer Contracts Regulations and you have the option to cancel your unused order up to 14 calendar days following receipt of your items. Should you wish to cancel your order please do so via the order cancellation page at the earliest opportunity and quote your order number on all correspondence. Please note we are unfortunately unable to accept any returns of e-liquid or drip tips for hygiene and health and safety reasons. Should the occasion arise where we have sent out the incorrect e-liquid we will happily send out a replacement upon confirmation of the incorrect product immediately at no additional cost to the purchaser. For us to issue a refund or an exchange for any cancelled order the purchaser must return the goods unused, undamaged and in a saleable condition to us at the earliest opportunity and no longer than within 14 calendar days of cancellation. It is the purchaser’s responsibility to return the item(s) within the 14 calendar days and to pay for the cost of shipping for the return. Once the returned goods have been received and are confirmed to be in an unused, undamaged and saleable condition we will happily refund the cost of the item(s) and the basic delivery cost. Please note we are not able to refund any additional delivery costs than the basic 2nd class shipping rate. In the unfortunate event that your items prove to be faulty when received we request that you contact us prior to shipping any faulty items as we will do our best to understand the fault via email or other means and speed up the replacement process. In the event that we require the faulty items to be returned to us then we request that this is done within 14 calendar days. Following receipt, should the items prove to be faulty, we will happily send out a replacement without charge and/or refund any reasonable cost you may have incurred when returning the faulty item(s) to us. We will also happily offer a refund in full for the cost of the item should this be the preferred option of the customer. Please note that all of our batteries, chargers, tanks and mods have a 30 day warranty that covers electrical faults only. Damage to goods as a result of incorrect use or physical damage and wear and tear are not covered under this warranty.